This morning, I attended a very interesting session on the economics of open access publishing for scholarly communications at the Public Knowledge Project conference in Vancouver. The session began with a presentation from Heather Morrison, who spoke about the broad ideas and macroeconomic view of open access publishing for scholarly journals. In particular, she made note of a number of areas where journals can reduce costs by transitioning to online/open access publishing. These obviously included the tremendous reduction in printing and distribution costs. Furthermore, she made particular note of the high cost of journals from large market publishers and the impact these publications have on library budgets. One of the biggest areas of savings for libraries under open access publishing would come from the reduction or elimination of high cost subscriptions and the need to devote resources to policing copyright. 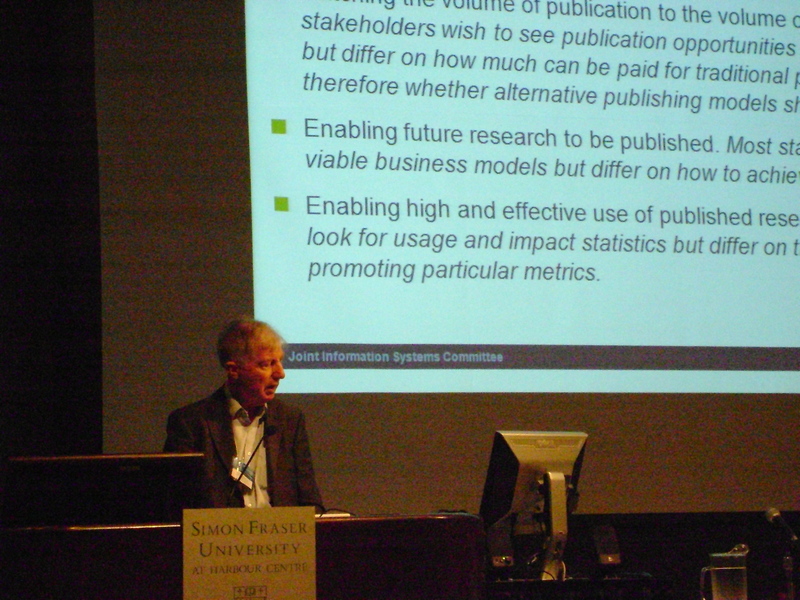 Frederick Friend, from the Joint Informations Systems Committee, also spoke about the future of scholarly publishing and the place of open access in that future. Currently, in the United Kingdom major publishers are vigorously resisting changes in scholarly publishing that are trending toward increasing access and online publication. The problem Friend noted is that while most funding agencies, universities, and authors accept the case for open access, deposit in repositories and publication in open access journals is still at a low level. He argued that this was a problem of advocacy. This may be true, but one issue that has come up repeatedly in discussions at this conference is the matter of tenure review. Morrison pointed out in her talk of the need for tenure review committees to begin to rethink the new landscape of open access publishing and the status of publications. If open access journals tend to be read more widely than restrictive subscription journals, should tenure committees take this into consideration?